A bit of a stretch of the theme - but I imagine that with all the work that goes into a garment, more or less every new garment is made with a special occasion in mind, and have always been. For that special party, or made and kept for a time when one had to look one's best and so on. I realise I documented this challenge poorly, even for me, but here goes anyway: The Bocksten kirtle. 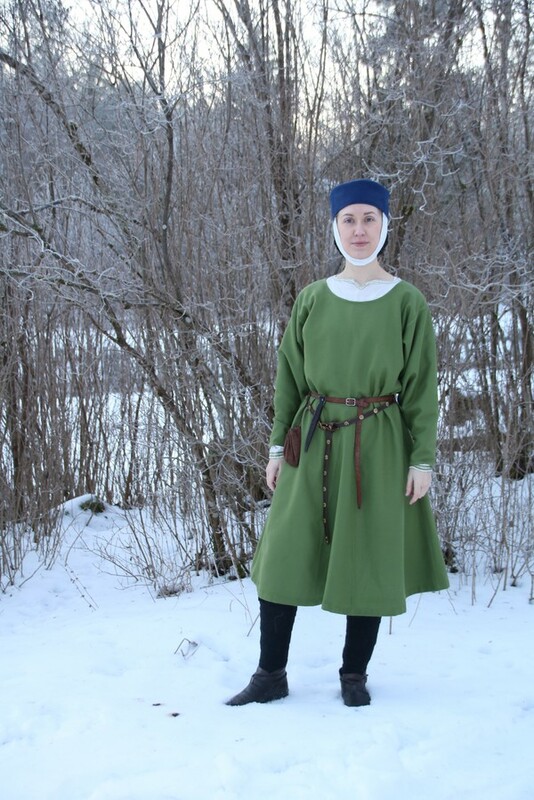 In January, I was to attend a larp that was set in a time and fashion resembling the early Mediaeval period (in Sweden, high Mediaeval for the rest of you). I have an unrequited love for Gothic fashion and the wide garments pre-1350, so I was only too happy to oblige. Also, the fictive fashion is even more unisex than its historical inspiration so to go for a Bocksten kirtle seemed like the obvious choice. I tend to agree with the idea that the Bocksten bog man was likely NOT a high status person, being rather backwards fashion-wise for his time of death and the fabric being less than fancy, but that model of clothes WAS at some point the height of fashion and in a thin wool in a pretty colour I figured it would work nicely for a slightly more posh character. The pattern sketch is literally all over the internet by now, this page is where I normally go for Mediaeval stuff. He in turn got it from Margareta Nockert's Bockstenmannen, Och Hans Dräkt. Halmstad och Varberg: Stiftelsen Hallands länsmuseer, 1985. [The Bocksten Man and his Clothes.]. Since the Bocksten man wasn't exactly a large man,at least not by modern standards, I realised I could just copy the original measurements, with a few alterations to fit the fabric I had. This meant adding a shoulder seam (in order to use the fabric more efficiently), making (or at least trying to make) the sleeves the same size and then of course some final adjust to make the sleeves behave, mostly by taking them in a bit just below the elbow. I also made the neck opening slightly smaller, because I was going to a winter event. Good thing the man had a liripipe hood, otherwise I'm sure pneumonia would have got him way before his killers did...! I was fairly pleased with the end result, but then again it was very relaxing to handsew a garment in unlined wool without much fitting. Therapeutic, even. Minimum of thinking needed. The finished garment (including the January challenge barbette from a less flattering angle). Photo by Torbjörn Walberg. Shoes are modern, and I still have to wrap my head round making proper hose. I guess new garments apart from perhaps workwear have always been saved for a special occasion, but I also made this for a larp that was, costume-wise, set in a period I haven't larped in for a while, so I made the tunic for a special occasion, too. Pattern: The documentation and measurements from the Bocksten find, with very few alterations. How historically accurate is it? Very. Fabric, pattern and notions would all pass. Unsure about the felled seams, but I'd still say about 90%. First worn: 14th of January 2017. In the photos worn with non-matching (period-wise) legwear and semi-matching (hairnet and barbette is sort of right, but the wool hat is not right for it as far as I know and as you can see I mix male and female garments wildly). Total cost: about 70 euros including notions and shipping cost for fabric.